Every summer a little voice inside my head whispers (with sing-song inflection) "It's time to make caramel" ...to which I reply "It's 100 degrees outside". My idea of fun does not include standing over a pot of boiling caramel in the dog days of summer; however, I begrudgingly heed the call... and obey. That's sort of how these came about. 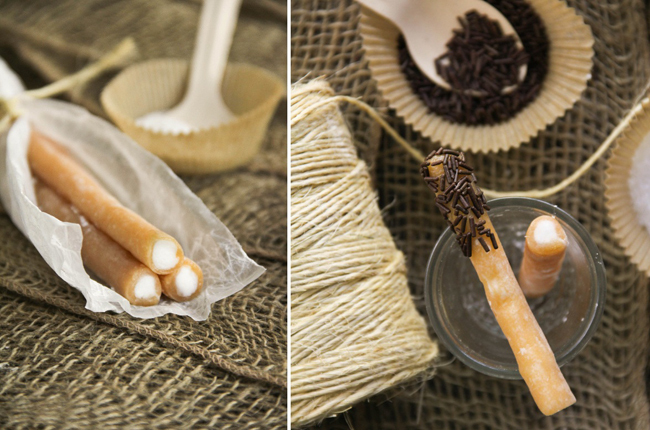 For those not familiar, Cow Tales® (not Cow Tails) are a nostalgic treat; an 8" length of soft caramel and creme filling. As a kid, I loved them and was inclined to choose one over a lollipop. I recently found them again and when I re-tasted for the first time in many years, my first thought was "this could be improved upon". I said it aloud. My husband accused me of food snobbery - which is simply not the case. You see, I have a special love for caramel. I love it more than chocolate (gasp!) and I'd like to think I know a little bit about what good caramel tastes like and how to make it. To beat the heat, I began my caramel endeavor in the a.m. By that afternoon, perfect 8" lengths of caramel and cream were piled on my table. Upon my first taste-test, I literally jumped for joy. They were one-million-times (actual number) better, but were still reminiscent of the original. I cannot wait to make these at Christmastime (1. for gift-giving, (2. in much cooler weather, (3. while enlisting some help from the ladies in my family. This makes a lot of candy, and the process will go quicker with an assembly line of people... plus, holiday treats always taste better over good conversation with loved ones. Right?....right. Edit 9/15/2012: A letter is received from Mitchell T. Goetze, president of Goetze Candy Company, Inc. requesting the placement of the registered symbol ® beside the candy's name. Cow Tales® are manufactured by, and is a Registered Trademark of Goetze's Candy Company , Inc.
1. Generously butter two 10x15 jelly-roll pans. If you don't have this size pan you may use sizes larger than 10x15. I would not suggest using sizes smaller than 10x15. Place both the pans on two cooling racks. 2. Turn stove-eye or burner to medium heat. 3. 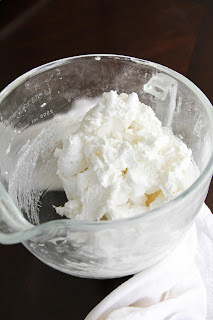 In a large saucepan combine the corn syrup, 1 cup of the heavy cream, sugar and pinch of salt. Stir well. 4. Set pan over heat and stir constantly until the mixture comes to a bubble. This will take about 10-12 minutes. Mixture will appear milky at first, then as it heats it will slightly lose its opaqueness. 5. When mixture boils, very slowly add the remaining heavy cream stirring constantly- be careful not to disrupt the boil. Lower the heat to medium-low. Set a timer for 6 minutes and allow mixture to bubble. It will rise high and bubble quite a bit during this 6 minute stage. 6. When time is up, add butter 2-3 cubes at a time and mix until butter has melted. Repeat with remaining butter cubes. 7. Insert candy thermometer and let mixture bubble until it reaches 250 degrees. When you first insert the thermometer, the temperature will be around 200-217 degrees. It will take a good 30-40 minutes for the mixture to reach 250. Do not rush this phase by turning up the heat. It is within this time frame that the caramel takes on its amber color. 8. When 250 is reached, remove pan from heat-source and pour half of the caramel in one pan and half in the other. Allow caramel to cool to room temperature. While you're waiting for the caramel to cool, make the creme filling. 1. In the bowl of a stand mixer fitted with the paddle attachment, cream together sugar,shortening and vanilla. The mixture will be dry and crumbly and you'll probably wonder if you've done something wrong. Nope! You're on the right track. Stop the mixer and scrape down the edges several times. 2. Place 1/4 cup water in a small bowl and sprinkle the gelatin over. Let stand until absorbed. 3. Microwave gelatin for 10 seconds or until clear and liquid. Add to the bowl of the running mixer. 4. The mixture will soften and become thick and doughy. Mix the heck out of it until it starts climbing the sides of the bowl. Scrape down the sides (and bottom, especially if using a Kitchen Aid) and mix again. 5. Place a portion of the dough in a disposable pastry bag or zip-top bag with the corner snipped. Make sure the hole is big enough to pipe a nice thick line of creme filling - at least 1/4". Set aside. Note: Cover remaining creme filling with a damp towel so it doesn't dry out. 1. Lay out several sheets of parchment or wax paper on a work surface - preferably a large cutting board or a surface you don't mind cutting on. 2. Remove caramel from one of the pans. It should remove easily if you lift one corner and peel the entire slab of caramel away from the buttered pan. Place it on the paper-covered work surface. 3. Cover caramel with additional wax paper and roll it a little thinner with a rolling pin. Try to achieve an even thickness. 4. 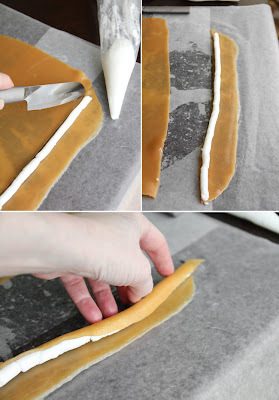 Remove paper and cut caramel into long strips, about 2-2 1/2-inches wide. Pipe a line of creme filling down one side of the length of the caramel. 4. Roll creme filling into the caramel. The caramel will fold over easily and overlap. 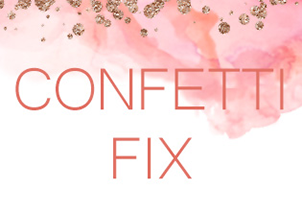 Roll and gently stretch into a 16" length. Cut in two 8" pieces. 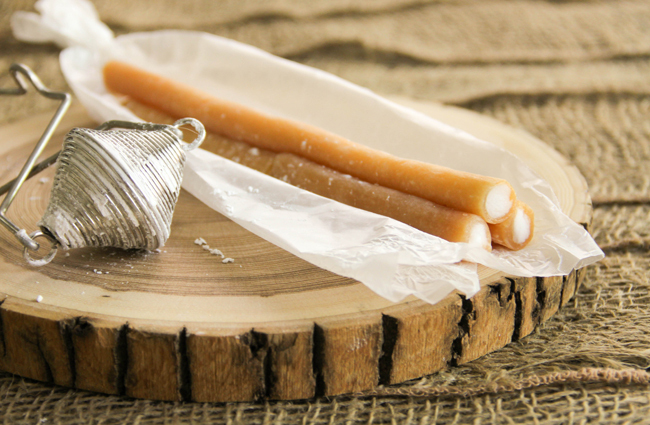 Tip: The caramel rope will squeeze together when you cut it, making the ends flat. You can either squeeze it back the other way to make a round end, or refrigerate the lengths for a few minutes before cutting. The cold ropes will snap off evenly at the ends when cut with a sharp knife. 5. Repeat with remaining caramel and creme. This will take some time, as there is a lot of candy to work with. 6. 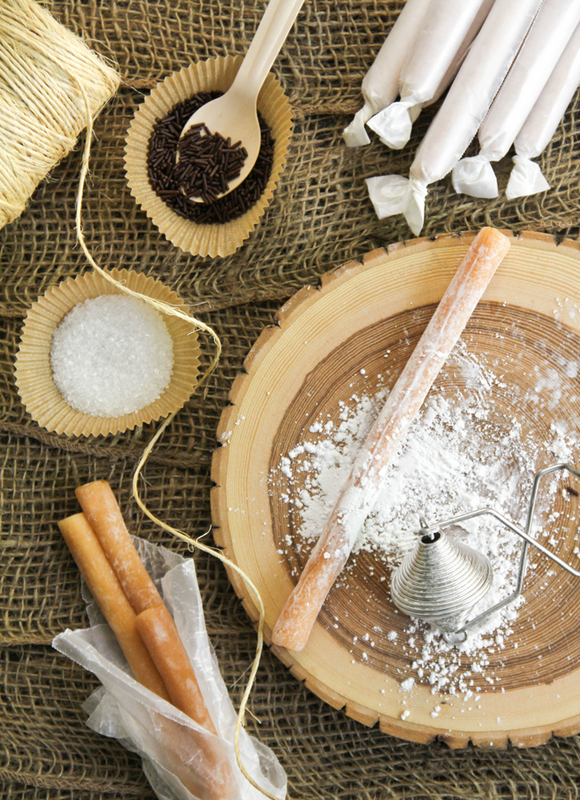 Roll the candy in powdered sugar and dust off excess. 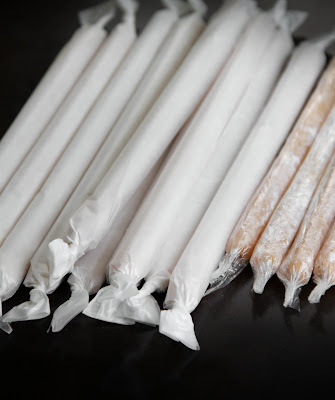 Wrap each candy in a layer of plastic wrap, then in a wax paper length with the ends twisted. This helps the candies keep thier shape. I too love caramel more than chocolate and these look heavenly! Definitely will add to my "Things to Try" list. Thank you for your beautiful pictures and detailed descriptions. how are you so brilliant my friend?! please be my neighbor. I've never had cow tales before and they sound absolutely delicious. I don't mind standing over the hot stove to make them especially if they taste 1 million times better than what used to be your childhood favorites! :) Thanks for sharing the recipe and the story. My husband loves caramel and this looks like something he would love! I like how you packaged them with the twisty ends. Great recipe! Nope, I've never heard of cow tales! Caramel and creme~sooo good! Like Mara, I love the packaging! As they have fresh cream in (if I'm understanding heavy cream correctly, it's what we call double cream here in the UK) do you have any advice on how long these could last? Do they have to be stored in the fridge? As this is a very new recipe, I don't have an accurate time frame of how long they will last. I still have lots of them on my counter-top, and they are just and fresh as day 1 (this is day 3). My advise is to store them at room temperature -or- in the refrigerator for up to three weeks (as directed in most caramel recipes). If you store them in the fridge, be sure to bring them to room temperature before they are enjoyed. Oh, and yes- you can use double cream for heavy cream. I think double cream has slightly more milk fat than our American heavy cream, but all the better. It will certainly work! I looove cow tales and they don't sell them here! I cannot wait to make this!! Cow Tales! I've never heard or even seen these. I love when someone introduces something new. They look yummy. My husband and kids are still talking about your previous post...the book cake. It was just spectacular. One of my all-time favorite candies! Can't believe you came up with a homemade version. I'm impressed! oh how we love cow tales! And you know if you want to make flavored one..we love banana..you could just replace the vanilla with flavoring of choice. I am printing this recipe out and keeping it for the holidays..soooo excited! OMG OMG OMG SOOOOOOOOOOOOOOOOOOOOOO going to make these! I have held off buying a candy themometer. It just jumped up to the want to the need list. O.M.G. Believing cow tails (although delicious and classic) could be improved upon is not food snobbery; I thought the very same thing the last time I had one! They just don't taste as caramel-y as they used to... or maybe I expect more because I love caramel so much. My husband's mouth was watering looking at these so I'll have to make them. Well, as soon as it cools down a bit. Thnks for another excellent idea! Please come to my house and make those..please? I will be your bff and make you scrambled eggs and give you a hug...deal? These are one of my favorite treats of all time. Are they in the mail for me? These are brilliant - and I want to come help you make them during the holidays, ok? :) Thanks for tempting this caramel loving girl this morning! I have never heard of Cow Tales until now. Sounds like I have been missing out- they look amazing! What a lovely site you have! 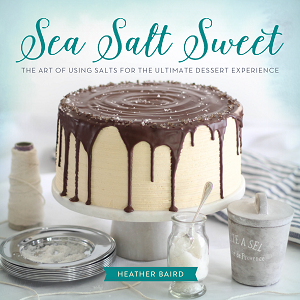 I was just introduced to you by my sweet friend Kristan (confessions of a cookbook queen) and I am thrilled to pieces! Everything is so beautiful & ethereal...the photos, recipes & storys! I can't wait to come back! AMAZING!! These look fantastic!! I love caramel and would definitely choose it over chocolate too!! Can't wait to try this this fall/winter! i was looking for a new treat for my kids stockings at christmas. this is it! So great of you to make these--thanks for sharing! Hi Heather--this is excellent! This recipe is putting me in the mood for fall. 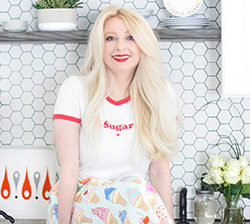 I am your newest follower--perhaps we can share recipes. My husband and I like to buy cow tails when we are on vacation. hah, these look amazing! This. is. genius! I love cow tails!! I had never heard of these before, but they look so, so good -- there's nothing like home-made caramel. 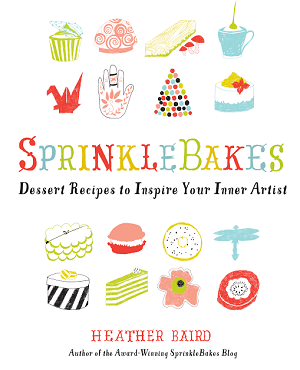 Ooh Heather, these look fantastic! They remind me of the Goetze's candies. http://www.goetzecandy.com/ My dad always loved those and it reminds me of him. I guess you could just make the same thing and then just slice them into candy pieces. Maybe I'll have to get over my fear of using a recipe that requires a candy thermometer! I totally remember these, and i LOVED them. Great Idea, a must try during the holidays. IS the filling in these marshmallow-y? My favorite see's candy is a scotch kiss, which is basically a marshmallow in caramel. I would LOVE to be able to make something similar at home. I agree with Kelly about the Goetze's. My dad and I used to share a 10 pack when I was little. Have to try these, will bring back wonderful memories....thanks for sharing!! I've never seen those sweets before! But i love it, looks nice and your photos are great! I haven't heard of them but I love caramel...homemade caramel not the stuff in a cube. Unfortunately I will have to wait until the weather cools considerably to make them in my neck of the woods! Heather, you know I love you. You know I do. I've told you on many accounts how amazing you are. But this post right here is just unacceptable! HOW do you expect me to go through life not making these? HOW did you know that Cow Tails are my favorite thing in all of creation?! 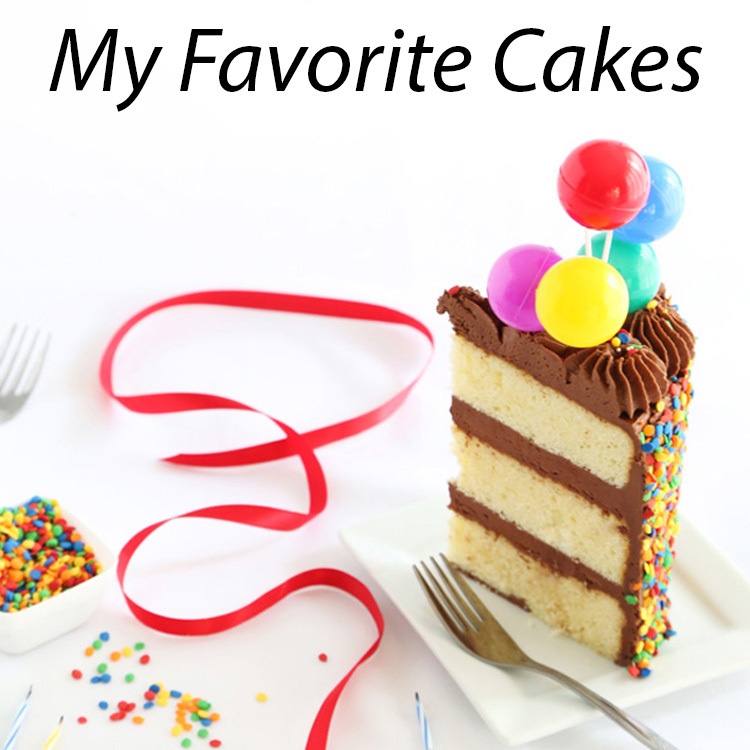 You, my lovely and darling blog friend are slowly making me become fat by all of these delicious recipes. And you know what? I love it!!!! Thank you!!!! My caramel cravings know no seasonal boundaries but bravo to you from braving these in this heat. They look simply scrumptious! love these! and the commercial ones are not gluten-free... so thank you, kindly, for once again bringing cow tails into my life. Cow Tales are also one of my favorite candies and these look amazing. I feel like I could probably polish off 50 of these no problem. Lady you are seriously our most favorite person in the world right about now. These are insanely adorable and look AMAZING. We want! These are soo lovely Heather. Have you ever had a Caramel Apple Cow Tale? I wonder if there is a way to flavor the cream to taste more like an authentic apple--that would be awesome for October! To Amy- Sorry for my slow response! The instrument in the picture is a flour wand. I use it more for powdered sugar than flour. I love Cow Tales. A couple months ago I tried finding a homemade recipe for them and didn't find what I as really looking for--which is this post-an exact replica of them! Thanks. I have never had, nor ever made a cow tale. They certainly look delicious. Great tutorial. Cow tales are the absolute BOMB!!! Nothing beats caramel and cream Thanks SO much for this recipe Cannot wait to try!! My now-grown daughter is going to love me (or really hate me if she is currently dieting) when I make a fresh batch of HER favorite, but rarely found, candy! How in the world did you come up with this method/recipe? LOVE IT! You're amazing! good lord woman you are talented. i've always wanted to make these but never had the nerve. and yes, perfect for gift giving. I have to repost these to my fans. (glad you got the link ok). tell them to take that down; i do all the time. Te han quedado perfectos, me parece una maravila de dulce. Caramel is worth it even in summer. This is not a candy I'd EVER have thought to make from scratch. I used to buy them for a few cents at the bowling alley in my hometown! These definitely look better though. These are one of my fav things on the planet! I can't wait to try them! can't wait to try these. do you think this caramel would be a good consistency also to make chocolate covered caramels? i don't think i have ever been so excited about a recipe. i used to love cow "tails" when i was a kid. i would nibble down one side to open them up so i could push the creme filling to one end and safe it for the last bite. so yummy! you've just made my dreams come true! cow tales are hard to find in my area. thank you so much for sharing! Do you think these would freeze well if wrapped tightly in plastic? I would love to make lots of these to give for Christmas gifts but I worry I'll run out of time before the holiday strikes in two weeks... I'd love to make them now and freeze them for then. Any thoughts? Is there anyway you could substitute milk for the heavy cream? Or would it be to runny?? Is there anything I could substitute for the gelatin? I'm vegetarian, and real Cow Tales are one of the few chewy-consistency candies that are gelatin-free. I was really excited to find your recipe, and then I read the ingredients. If there's anything I could substitute for the gelatin, I'd be pleased as punch to hear about it. Thanks in advance! Do you have in mind Fahrenheit or Celsius degrees? 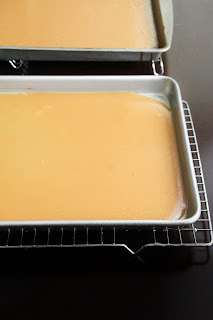 Could I just pour the caramel onto parchment paper, instead of a buttered pan? My pans aren't in the greatest shape. You could do that, I suppose. Just make sure to lay out a large piece of parchment so the caramel will have plenty of room to spread. Cow tales were the most craved item I could fi d while pregnant with my daughter in TN. When we moved back to WA state I couldn't find them anywhere! They sell them in a few convieniece stores now. But I definitely am going to try to make some!! Thanks for sharing!!! Lol, I can't believe you got a letter from the president of goetzes.. I've seen lots of recipes online for homemade versions of candy from other companies like mars and nestle and I don't think I've ever seen any trademarks on those posts.. Maybe you hurt his feelings by saying you could improve upon his product! These look great ! 2 Questions - Do you constantly stir the caramel as it is bubbling its way up to temp ? and Can they be coated in Chocolate ? Hi! You do not have to stir it constantly while it comes up to temp. I suggest letting it bubble away without stirring as it comes to 250F. I made these today! They were hard to work with because I made the caramel too thick :( still delicious though!!! Thank you for the recipe! YUM! I just made these, and, even though it was hard work, definately a winner! I couldn't find unflavored gelatin at my local store, so, I grabbed some French Vanilla Pudding Mix and called it a day. It tastes wonderfully like the originals! I just tried making these, but sadly, I believe I overcooked my caramel and I am left with a slightly chewy toffee as well as my premade creme...I suppose I'll try again later in the day after I replenish some of my supplies, but I am disappointed that I missed it first time around ha. At least it's good toffee! Update: I melted down my overcooked caramel, added about 60% of my creme mixture to the caramel as well as a couple tablespoons of heavy cream and it's made a wonderfully creamy caramel. I've used the remaining creme to top the small caramel pieces and it's delightful! Cow tails are old fashioned flour candy, which this caramel is not. It is the flour that makes flour candy special. 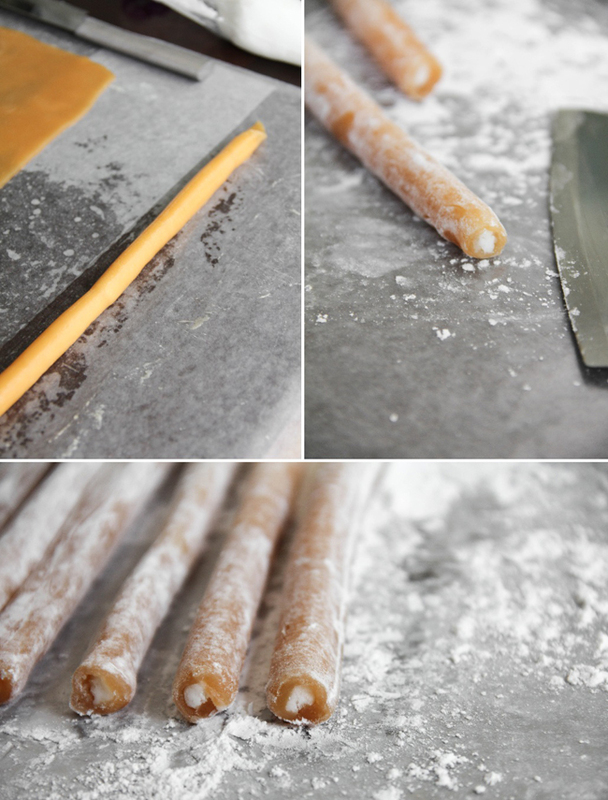 This is nice, but not to fans of real flour candy, which is like raw cookie dough in texture. I agree, the two candies are quite different. Hi! I am Stefania from Italy, I found out your recipe on Pinterest, It's amazing! I would like to cook it, but I have a question: how do you maintain these candies? For how long? 2 months is possible? very disappointed. Cow tales are one of my favorite, but I think I overcooked the caramel. It's more like hard crack stage rather than soft. It breaks and doesn't roll........UGH. I'm glad that I didn't start making the creme filling yet. What did I do wrong? Temp was 250º when I removed it from the heat. Hi Ronna! I'm sorry you had trouble with this recipe. It's hard to say what happened with your batch. Hard crack stage is around 300 to 310F, so the problem may be with your candy thermometer. You can check its accuracy by placing it in boiling water. It should be 212F at a rolling boil. If it registers differently, you take the discrepancy into account next time you make candy. You could also babysit the candy the entire time it cooks, and do testing of 1/2 teaspoon candy in cold water. When the candy is soft and pliable (soft ball stage) then you can remove the pot from the heat. I hope this helps! How would I make these without heavy cream or gelatin?